Well I've lurked on the forum for long enough, I though I would post my project. 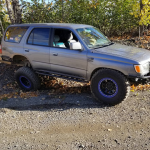 It's a 1996 4runner with the 3.4 and a yucky auto trans. I got it about a year ago, bone stock with flares and all. It has a recon title from a small accident a while back, but scored it for 2500 bucks so I was willing to look past it. I've spent the last year trying to make it capable enough to get around, but don't want to straight axle it till I'm out of the military. So far it's gotten a tg low profile front bumper, tg 67 inch sliders, custom rear bumper, spartan locker in rear, smittybilt x20 10k winch, 3" lift and 33s. I think it's a good little wheeler, and will be a good base for my crawler when I get the time to sas it. Not a forum guy so once I figure out how to post a pic, I'll post a few. Just trying to crawl on a budget! Thanks! 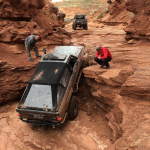 Not new to wheelin or crawling, just to the forum experience. I want to get back down to Cali pretty bad and run this thing through the 'con. There are almost no rocks/technical trails up here. Mainly just bottomless mud holes. Now I have a 3rd gen!